Jake and the Slippery Bank Robbers is for Ages 9-12. Jake and the Slippery Bank Robbers was written by Phil Callaway. Jake and the Slippery Bank Robbers was published by Cygnet Books. 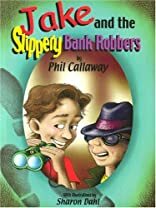 Subjects of Jake and the Slippery Bank Robbers include Action & Adventure, Action & Adventure - General, Children's 9-12 - Fiction - General, Family - Siblings, and Humorous Stories.